One of my goals is to be able to reliably bake a good loaf of bread. To me, a good loaf of bread is one that is easy to make, doesn’t use many ingredients, and tastes good. I started with a recipe I found in Adbusters, then changed it to be tastier and easy to make. This is still a work in progress – if you find a way to improve it, email me! First, proof your yeast to make sure it is alive and kicking. This just involves dissolving a tablespoon of honey in 1/2 cup warm water, then stirring in your yeast. It’ll smell like beer, and that’s okay – set it aside for 5 minutes. While you wait, combine 4 cups of flour with 1/2 tablespoon of salt and 1 cup of warm water in a large mixing bowl. By this point, your bowl of yeast should be foamy. Pour it all in to your wet salty flour mix and stir it in. This will be pretty dry, but try to get it as uniform as possible. Cover and put in a warm, damp place for 90 minutes. I like preheating the oven a tiny bit then turning it off and letting my dough sit in the oven. While you are waiting, prep a baking pan by covering it with aluminum foil and greasing it (I like using butter). After 90 minutes, your dough should be well-risen. Take it out of the mixing bowl and knead it for 10 minutes on a warm, floury surface. Adding a line of olive oil at this point can keep your dough from sticking as well. Form the dough into loaves of any shape – I’ve done baguettes, rolls, and Italian loaves – and put them on your greased baking sheet. Set the formed loaves back in the warm (but not hot!) oven to rise for another 90 minutes. If they rise too far and connect themselves, separate with a knife. When your loaves are done rising, cover the tops with melted butter and turn the oven up to 450° F.
Bake your loaves for 15-20 minutes or until the tops are golden brown. Remove loaves from the oven and put on a cooling rack. 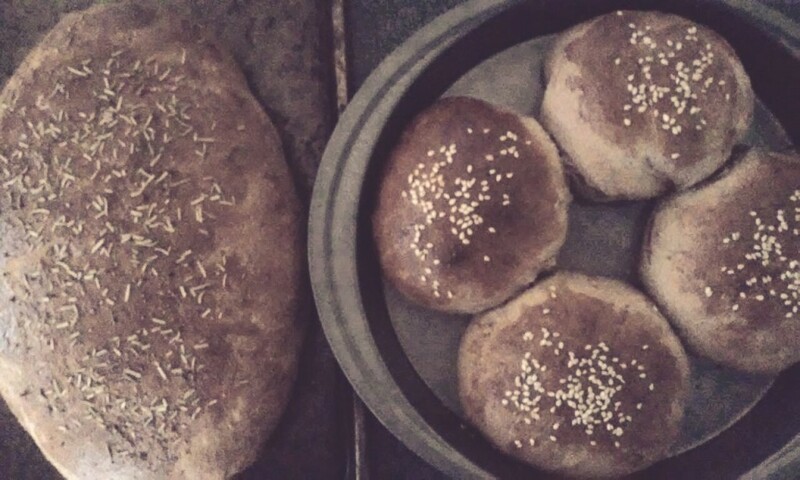 Loaf with garlic salt and rosamary, and four sesame rolls baked by Emily Wavering.